A shower riser kit is a rigid option for your shower which is generally fixed in position and set to a preferred height. A full kit includes the rigid riser (rail) and shower head; and with some shower riser kits there is an additional handset connected via a flexible hose and switched between using a diverter. Not only do rigid shower risers look impressive, they also create a luxury shower experience too. 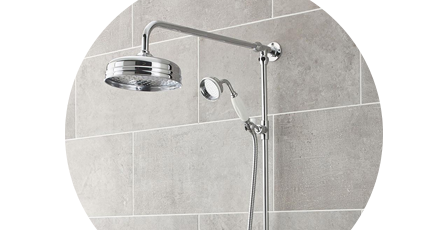 The oversized shower heads create a relaxing rainfall effect which you can reap the benefits of every day. Rigid shower risers are typically traditional by design, but there are lots of contemporary styles making them perfect for any bathroom setting. Find the perfect shower riser kit for your home or shop our shower riser accessories including rails, heads and arms.